About a year and a half back, I capped off a post about a trip to the Braga Bridge in Fall River with a tease about a sighting of a suspension bridge far in the distance -- the Mount Hope Bridge. And that was the last I posted for months. I wasn't thrilled by any of the pictures I took that day, really, and considered it kind of a wasted trip. A viaduct hunt had not gone well. The Braga Bridge was lit all wrong. Another bridge I wanted to photograph, I could only see when I was driving over it. And they NEVER let you get out of your car on those things. Got home, saw these pictures, and they just didn't do the bridge any justice at all. Because this is a gorgeous bridge. It's also the only bridge that will get you onto Aquidneck Island (and down to Newport) without a toll. You might wonder if it's worth the inconvenience of coming into the area from the north to use this bridge just to avoid a few bucks in tolls, but my father would go ten miles out of his way to avoid a four bit toll, so... keep that in mind. I wasn't holding my phone to take these pictures as I drove. I have a dash mount for the phone. Regret not bringing it for the Bourne Bridge last weekend, but anyway. The Mount Hope Bridge was completed in 1929, just days before the stock market crash and the Great Depression. It's over a mile long and 135 feet high in the middle. 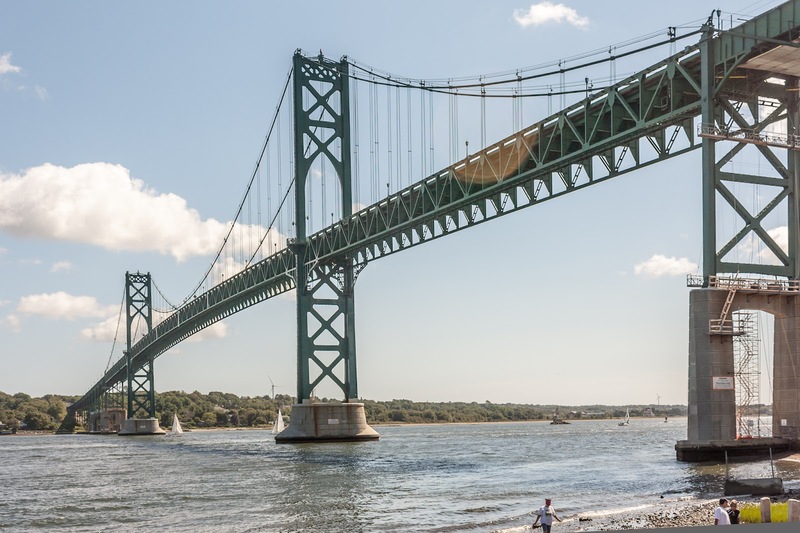 There's several parks in the area, and if you're into sailing -- you're just not going to find a prettier group of bridges to sail under than the three that cross the Narragansett Bay. This was a warm, September day -- after the America's Cup races, I think. I missed those because of the crowds. I did get a really good look at the underside of the bridge from one of these parks, one that seemed claimed by locals. 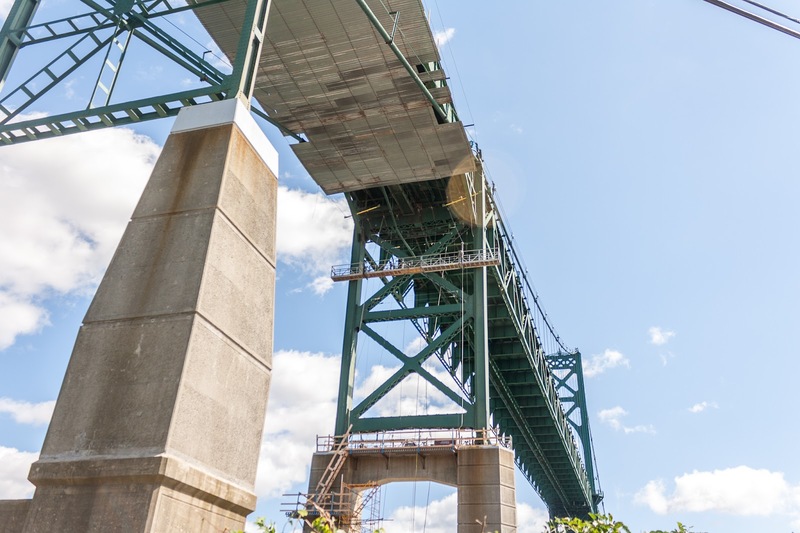 I've seen this kind of cladding beneath bridges many times -- in the Sagamore Bridge post, you can see sheeting covering the bottom of the bridge in both directions. I'm not sure why they put it there. In this case, it might be to protect the people working on the bridge. Dunno. The Mount Hope bridge was the longest suspension bridge in New England until the nearby Clairborne-Pell Bridge took the crown some years later. I've actually inspected this bridge and at the time of inspection the staging was set up for repairs to the floor system. At the Sagamore the staging is set up for paint removal and painting. It's just a means of temporary access which is needed for a long duration, such as repairs or painting. Thanks for the info! I kinda figured it had something to do with working on the bridge, since it didn't seem to have any functional purpose.